Backlight Priming Filter: This primer is an illuminating primer that also has a bit of skin care. It has Vitamin E to minimize the appearance of fine lines and Licorice Extract which helps to tone and tighten. Aside from that it has a tone of Glycerin which makes makeup last longer because it's a humectant, which helps to retain moisture and helps your foundation last longer. I am really impressed with how this primer feels on the skin and also the way it looks. If I were having a no makeup day I would put this on just to give my skin this gorgeous glow. 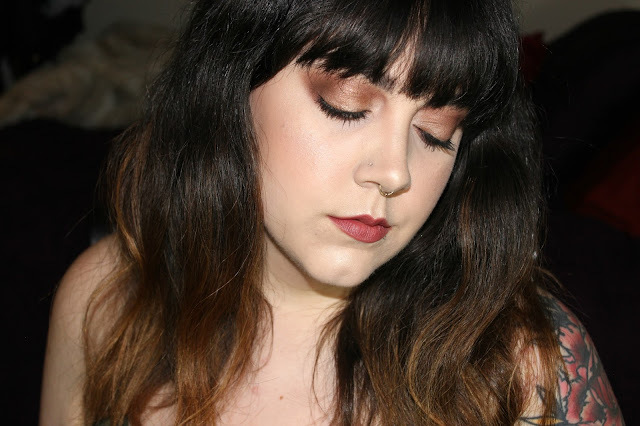 Ultimate Coverage Complextion Creme: This foundation! No, really, this foundation!! I have not liked a foundation this much since I first tried Make Up For Ever's HD. This is a full coverage, 22% water based foundation with 21% pigmentation. Though this is a high coverage, there is a light, hydrated look to the foundation that can be void from other full coverage looks. It wears really well and never gets cakey, whether powdered, set with spray or used without a primer. I will say I get a little shiny after about 5 hours of wear but a light dusting of powder and I'm back in the game. This foundation has no SPF which means it photographs beautifully, without flash back. I have never seen such a full coverage foundation look so skin like. I am using the shade Cashmere. One of the things I like best about Becca is they cater to all skin tones, twenty shades in all! I always want to support brands that don't exclude part of a buying market that should have shades made for them too. Knowing that I could use the same products on a large range of people makes me very happy. Beach Tint: I have a full review of two other shade of Beach Tint here. A quick run down is that it's a non-drying cheek and lip tint that is water resistant and is comfortable to wear. They are quite pigmented so be careful when applying to the cheeks. I got the shade Papaya this time and it has a red/orange tone. Shades like this look great just on the apples of the cheeks. When you place the color up higher on the cheekbone it can appear too red and overdone. On the lips it adds a fresh faced flush that stays through eating, drinking and fades in a completely unnoticeable way. You can reapply at any time and it doesn't get caked up. I now have three colors of the Beach Tints and I'd love a couple more. Shimmering Skin Perfector Poured: The last step to some glowing skin was to use the cream highlighter in Pearl. I used my fingers to apply this to my cheek bones, tip of my nose, chin and cupids bow. This shade is literally pearl white, so it's really good for fair skin, but there are five shades in total to choose from, so everyone is glowing! This product is so nice and is a great base for a powder highlight on top for a high beam look or alone for a super angelic look. that has been a let down to me. Is there a Becca product you would recommend for me to try? Is there a product you want me to trial before you buy? Tell me what you think in the comments!